There’s a time when buying an entry-level Blu-ray player could set you back at least $1200 and it’s 2006. It’s a time when people would buy a PS3 purely for playing Blu-ray discs as it’s cheaper than a normal Blu-ray player and it supports Blu-ray. But things have changed. The prices of Blu-ray players have been coming down and it’s now fallen into a reasonable level. Now would be a good time to get a Blu-ray player for a reasonable price. If you have limited budget, check out our recommendation of the best cheap Blu-ray players. The Sony BDPS6700 topped our list for a good reason. It’s got some of the most desirable features you would want in a Blu-ray player and you can get all those features for only $98. The biggest advantage of this Blu-ray player would be 4K upscaling. It can upconvert the quality of a regular HD Blu-ray movie to 4K with surprisingly good results. It’s got an HDMI port for connect other devices, a USB port for playing media files from storage devices and one Ethernet for connecting to the Internet and streaming videos from popular sites like Netflix, Amazon, and Hulu. It also supports Miracast which allows you to mirror the screen of your smartphone to your TV. And the support for DLNA allows you to quickly share digital files with other supported devices wirelessly around the house. 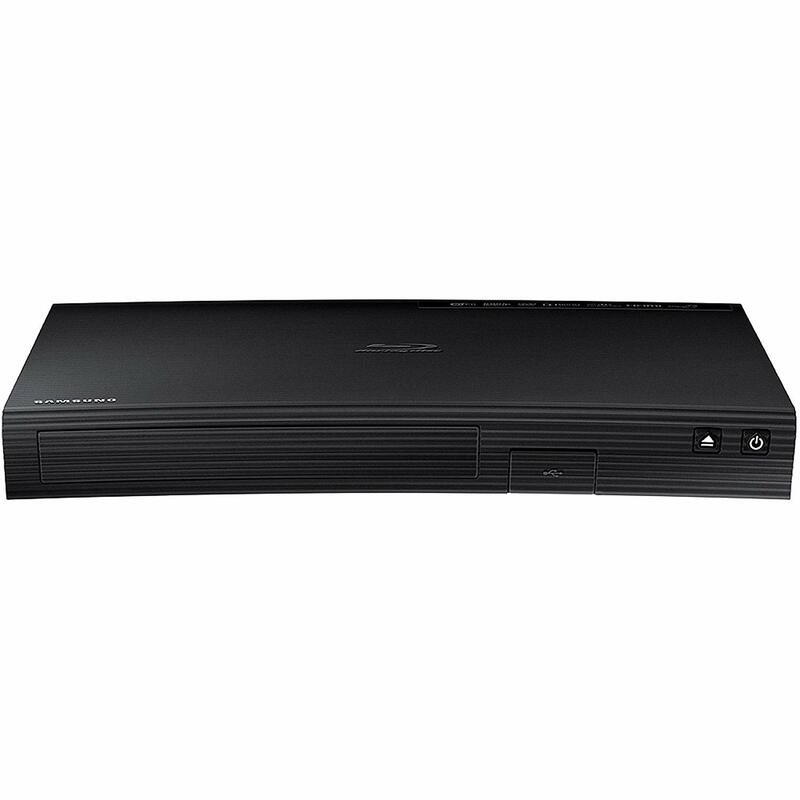 This Blu-ray player from Samsung delivers great Blu-ray playback quality. The playback of high-def Blu-ray movies are remarkably high quality. Another selling point is its ability to upconvert any video to HD quality, which means you can use it to play your DVD collection and expect the graphics to be as good as Blu-ray. It also has Wi-Fi and some pre-installed apps that could help you send files back and forth between the player and other devices. It also has a remote to help you control the player. But be sure not to lose the remote as there’s no physical button on the player. If you lose the remote, there’s no other way for you to control it. 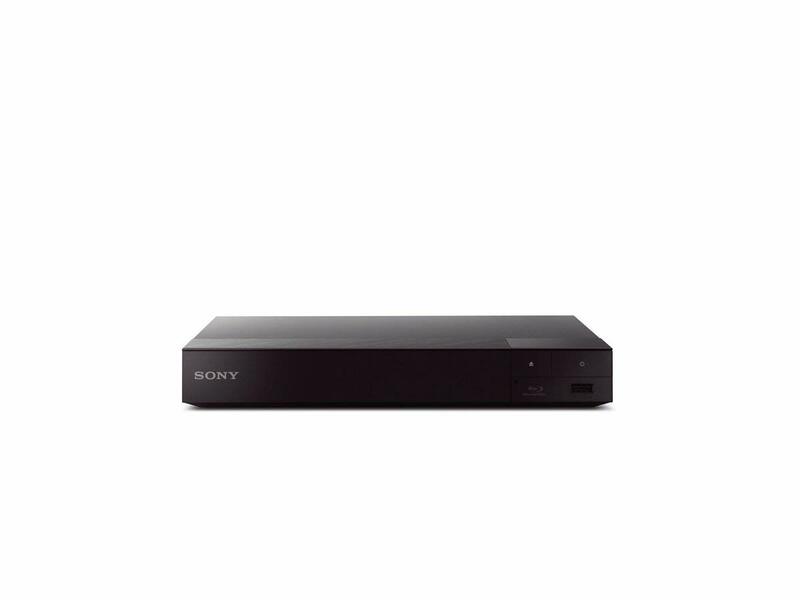 You can get this Blu-ray player for $76.99. Technically, the Panasonic S700P-K isn’t a Blu-ray player as it can’t play Blu-ray discs. But like a lot of Blu-ray players, the Panasonic S700P-K can upscale your regular DVDs to 1080p so that you can watch the DVD movie with the quality of Blu-ray and the resulting graphics is surprisingly good. The most important thing is, it’s completely region free. So you can basically play all kinds DVD discs without having to worry about region codes being an issue. This DVD player is priced at $58.97. Other than a Blu-ray player, you can also consider getting a Blu-ray drive to watch Blu-rays on your computer. With a Blu-ray drive, there are more things you can do other than watching Blu-ray movies. For example, you can use it to rip your Blu-ray collection to common video formats like MP4 so that you can watch the movie on your iPhone or iPad. The price of a Blu-ray drive is close to a Blu-ray player. As is mentioned before, if you have an external Blu-ray drive, you can also rip Blu-ray to your computer for playback on it or other devices. If you intend to do that, check out Leawo Blu-ray Ripper, it’s a top-notch Blu-ray ripper program that can help you rip your Blu-rays to lossless MKV and a lot of other popular formats. ☉ Supports ripping Blu-rays to lossless MKV and a lot of other popular formats. ☉ Built-in video editing features for editing videos. ☉ Converts 2D movies to 3D. Note that you won’t find the shortcut icon of Leawo Blu-ray Ripper as it’s Prof.Media that you will install because Leawo Blu-ray Ripper is a module inside the latter. 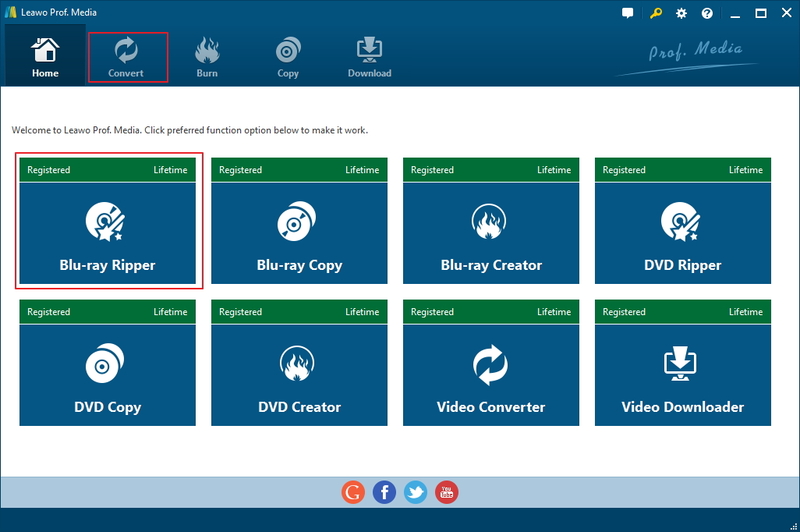 Below you will find the instructions for using Leawo Blu-ray Ripper to rip your Blu-ray collection to your PC. Step 1. Double-click the Prof.Media icon to launch Prof.Media. After a few seconds of loading time, click the Blu-ray Ripper tab as you enter the main interface of Prof.Media to launch Blu-ray Ripper. Step 2. Insert the Blu-ray disc you want to rip to your Blu-ray drive. It should take just a few seconds for your computer to detect the disc. As it does, you can find the Blu-ray folder in the File Explorer window and drag the folder to the program to add the disc data to the program. Alternatively, you can click the Add Blu-ray/DVD button and click the Add from CD-ROM option. The menu that appears on the right side of the Add from CD-ROM option is the name of your disc, click on it to load the media files in the disc to the program. Step 3. Most discs will contain multiple videos and if you don’t need all of them, you can exclude the videos you don’t need in this step by choosing Custom Mode or Main Movie on top of the left sidebar. If you use Custom Mode, you can select the videos you need manually from the video list. You can play the videos with the video player on the right to make sure that you’ve chosen the right video. And you can select Main Movie so that the program will only rip the main movie from the disc. Full Movie is used when you want to rip all videos in the disc. Click the OK button below the video player to allow the program to load the chosen videos to the video list. Step 4. The default output format is MP4, which you can see from the Format button above the video list. Click on the Format button and there will be 3 more buttons on the following menu. Click Change to open the panel with all the supported output video and audio formats for you to choose. If you intend to watch the movie on mobile devices, MP4 would be a good choice. You can choose regular MP4 profile or HD or even 4K MP4 from the format choosing panel. You can also choose lossless MKV from Format>Lossless video. 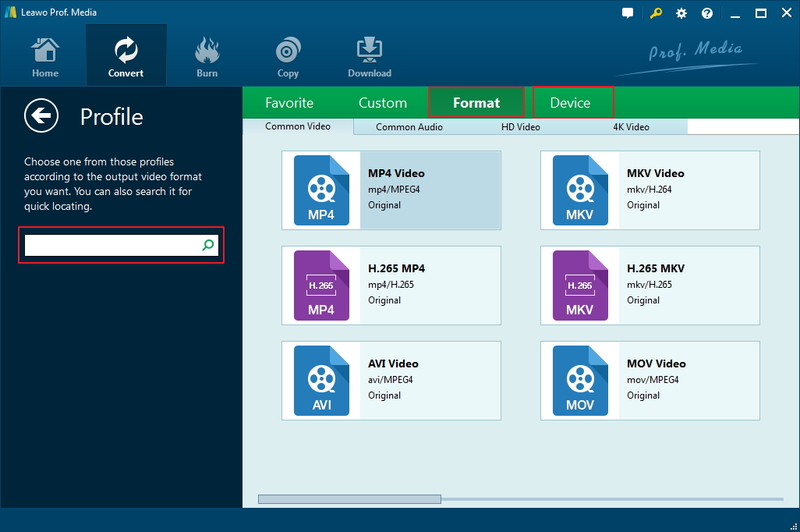 The Multi-track MKV is the profile for ripping Blu-ray movies to lossless MKV. Click on the format or profile you need as you find it to set it as the default format for the movies. Step 5. Click the green Convert button on the right of the Format button. You will see the default output directory on the following sidebar and you are allowed to reset it if you need. And then you may start to rip Blu-ray by clicking the Convert button at the bottom. Below is the video guide on using Leawo Blu-ray Ripper to rip Blu-ray to your computer. Other than getting the best cheap Blu-ray player, a suitable Blu-ray drive and Blu-ray ripper software are also considerable alternatives. 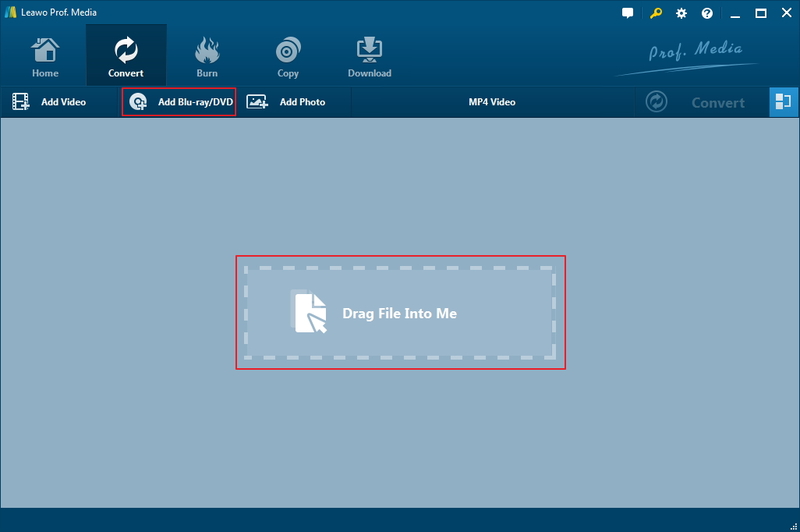 You can try ripping Blu-ray to MP4 and watching the movies on mobile devices.